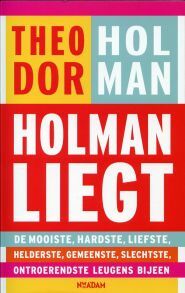 'Theodor Holman Liegt' is a Dutch publication, a selection of columns written by Theodor Holman for Parool (newspaper in the Netherlands) in recent years. He writes about personal relations but also, from a distinct personal perspective, issues in media or current affairs (e.g. Islam, royalty). He can be quite cynical, which I like but which is not appreciated by everyone. He studied Dutch language and History at the University of Amsterdam. He was editor of the satirical student newspaper Propria Cues. Holman (b. 09Jan1953) has also worked for Dutch television (AT5, KRO). Very much enjoyed this book, found it ideally suited as bedtime reading. On behalf of nearly half a billion people who read Wikipedia, thousands of volunteer editors, and staff at the Foundation, I thank you for keeping Wikipedia online and ad-free this year. I stumbled on this series recently, in a dvd box; 9 episodes on 3 dvd's, 3 stories. This is truly 'feelgood crime'! and steers away from the usual 'Scandi noir' and I loved it! I have to admit that the radiant beauty of Alexandra Rapaport contributed to this by no small means. 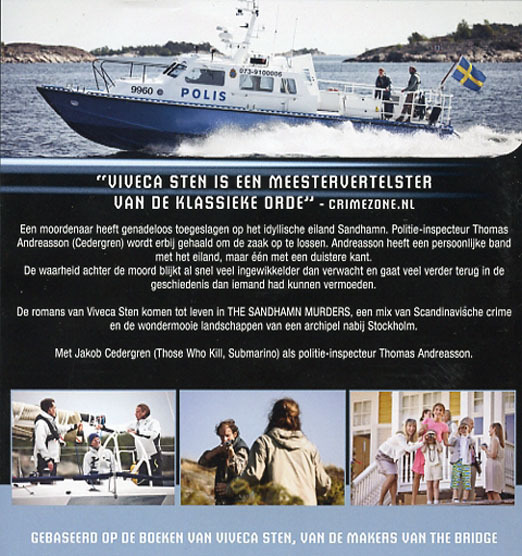 Thomas Andreasson (Jacob Cedergren) is a police officer who gets sent to Sandhamn, a small island 2 hours away from Stockholm. It’s a quiet and quaint place Andreasson knows well as he used to live there. He is sent there because a body is found and foul play is suspected. The body was found by Nora (Alexandra Rapaport), who rents a cottage on the island with her family. Thomas and Nora knew each other from school. As the series progresses, her role becomes more important because there is a obvious, smouldering chemistry -waiting for a spark- between Thomas and Nora. But Nora is married with 2 kids. And Thomas is recovering from sad, personal circumstance. 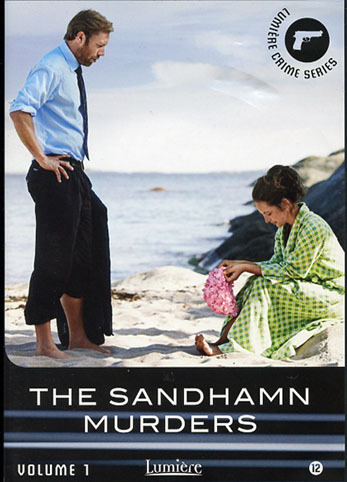 The Sandhamn Murders are based on a series of books by Viveca Sten. The beauty of the Swedish archipelago east of Stockholm is very well portrayed; the summer weather (the summer being a prerequisite condition for people occupying their summer houses on the island) obviously portraying rather favourable conditions. I must go there one day, in the summer. 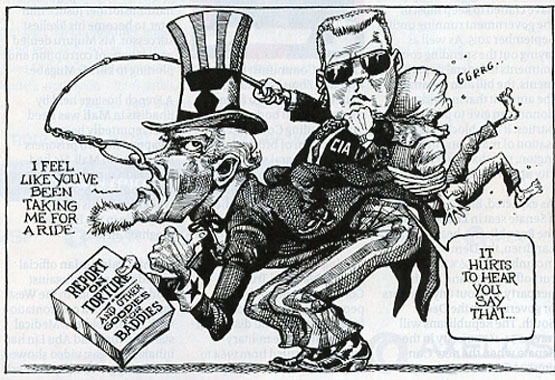 Senator Dianne Feinstein has helped expose CIA torture. In this essay in slightly under 100 pages, Maarten van Rossum manages to paint, with a broad brush, the economic history of Western Europe after WW2: the rebuilding, the seeking of a commonmarke resulting in (a.o.) the EEC, the stragglers, the exceptions, a desire for a single currency, the unification of Germany, creation of the euro and the EU plus dealing with the economic crisis since 2008. 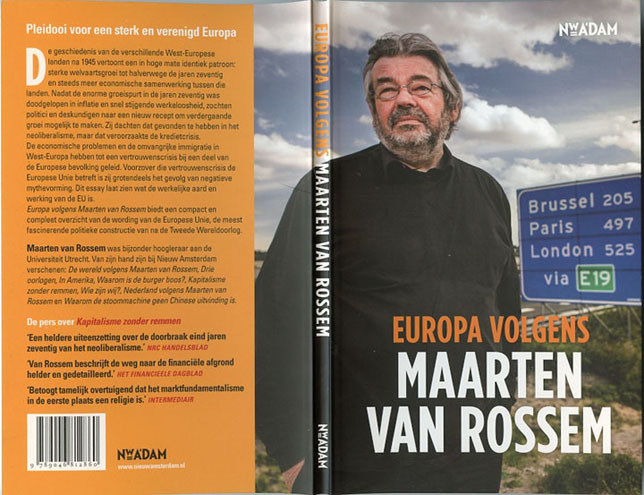 Van Rossem describes (in Dutch, I don't know if there is an English translation, perhaps of his book to be published on this subject) in his usual sober style, devoid of the populist hysteria and mixed variations in daily reporting. For me a very useful description of the basics of European economics during the past 60 years. Last week I watched episode 96 ('Series 16', 2013-14) of Midsomer Murders, featuring the first appearance of Gwilym (a Gealic interpretation of Guilleaume and William?) Lee as DCI Barnaby's sideskick, DS Charlie Nelson. Nelson replaces DS Ben Jones, a role performed by Jason Hughes since 'Series 9' (2005-06). After Inspector Lewis THIS is probably my favourite (British) tv series. 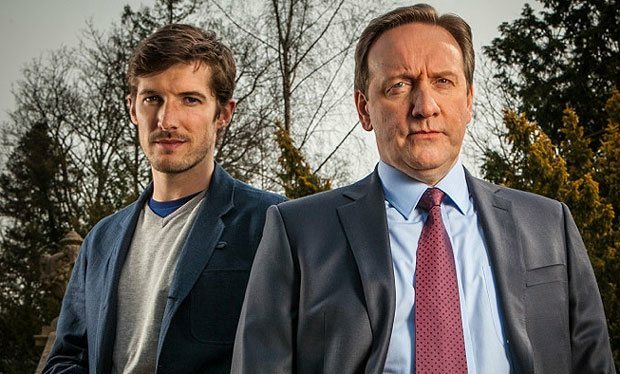 June 2016 brought the Series 18 of Midsomer Murders on my telly; episodes 105-110. I am not big fan of US (crime) series, consider most to be two dimensional crap and will avoid watching that stuff. I have to make an exception on this HBO series, True Detective. Although it won't convert me to watch American series again, but Woody Harrelson and Matthew McConaughey manage to hold the attention. The music by T Bone Burnett is a big plus and the various other music (Lucinda Williams a.o.) blend in well. The photography of the Louisiana swamplands is a compelling canvas for the full picture to develop. 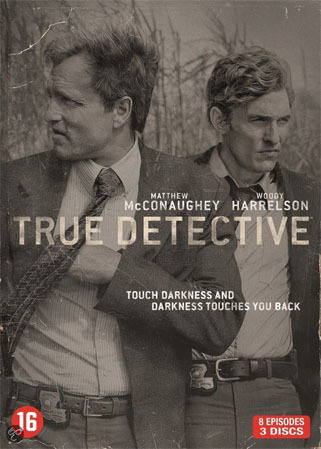 Detectives Marty Hart (Harrelson) and Rust Cole (McConaughey) work mid-1990s on solving a weird murder case, with all the voodoo stuff one associates with the Deep South. Rust is a nonconforming oddball, Marty is one 'for the book'. Opposites attracts, right? No surprises there. Both are being interviewed, seperately, on that murder case and how they went about it. Because another murder happened with the same modus operandi, at a time when Rust reappears in the area, having gone off the radar for several years. Both are no longer with the police. Rust manages to convince Marty the job has not been completed and they reopen the investigation from Marty's P.I. office. My objections to this series is that, as usual in the American series, no caricature is avoided: the whole Deep South is full of tattood weirdos, and Marty & Rust are boozing, cursing machos but with a fight for justice on their mind, willing to risk their lifes. During 8 episodes we only learn a minimal of the backgrounds of these two detectives. No other characters show any background, not even much of Marty's wife Maggie, who divorces him; her role seems to have been cut to desperate looks and domestic quarrels for the husband she lost on booze and cheating. She ends up in a big house with the kids provided for but no clue whether this was due to Marty's alimony or a new husband. Marty's teenage kids showed promise for some sidelines but they disappear from the storyline. The strong point of the series is beautiful photography of the Lousiana landscape, the music and enough of a plot to keep you hanging on. 'American Tabloid' is a story about two rogue American law enforcement officers, Kemper Boyd and Ward Littell, over a period from 22Nov1958 through 22Nov1963. The third main character is Pete Bondurant, an extortionist and hitman (for Howard Hughes a.o.). Kemper Boyd is a lawyer and a silver tongued devil, who gets a career boost by J. Edgar Hoover. Kemper Boyd also becomes friendly with J.F. ('Jack') Kennedy (and to lesser extend to Robert Kennedy); he becomes involved with Laura, an illegal daughter of Joe Kennedy (supposedly Ava Gardner's daughter). Kemper participates in JFK's election campaign, extends his services to the CIA and swaps information to facilitate his career and expensive living expenses. He spins a web of lies. Ward Littell, a friend of Kemper Boyd (both lawyers), falls short of joining the Top Hoodlum Program and he does not succeed in convincing Robert Kennedy, whom he adores. But events, where the Mafia is concerned, turn the tables for him. Pete Bondurante is a criminal who admires Kemper Boyd for his dealings, and they see mutual opportunities to enrich themselves. One such project involves the CIA and the Mafia; Kemper Boyd surfs the tide of events and convinces all and sundry that he can steer Jack Kennedy to an invasion of Cuba plus the assassination of Fidel Castro. Kemper and Pete become instrumental in selecting & training mercenaries for this purpose. Each of these characters gets entangled in a web of associations between the Mafia, the CIA, the FBI, Jimmy Hoffa and Howard Hughes, which ultimately leads to their involvement in the assassination of JFK. Other persons that get mentioned: Frank Sinatra, Peter Lawford, Marilyn Monroe, Jack Ruby, mobsters, Cubans, and more. For me the book became more interesting when Kemper Boyd had difficulties keeping all the balls in the air, living on dope and lies, while Pete sees this coming but unable to help himself loses focus and falls for a woman. And when Ward manages to struggle out from under, and goes out for revenge on those who have rebuffed his services. It is the first book in 'The Underworld USA Trilogy', with the others being 'The Cold Six Thousand' and the final book 'Blood's A Rover'. 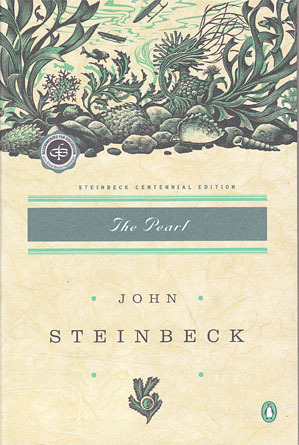 Each chapter is told in the third-person by one of the three characters and the 100 chapters are interspersed with document inserts reproducing newspaper clippings, letters, and transcripts of telephone calls. Ellroy writes in a clipped hard-boiled prose style and paints a portrait of America that was built on racism, murder, and corruption. This style did not have a great appeal to me and I have to admit at times I found it a struggle to continue, also because I've never been that fascinated with the Kennedy saga. James Ellroy has written other outstanding novels including 'The Black Dahlia' and 'LA Confidential'. Also a non-fiction book about the murder of his own mother ('My Dark Places') that led him into a life obsession with crime. 'Destination Morgue' is both a disturbing and hilarious collection of non-fiction and 'Hollywood Nocturnes' is a good collection of short stories. 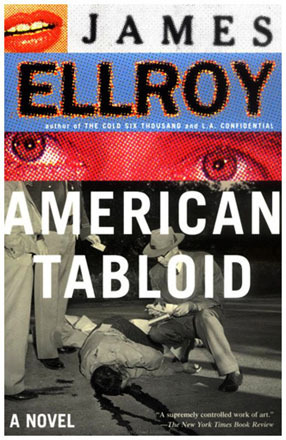 Ellroy's body of work is a critique of how power is attained through corruption in America. 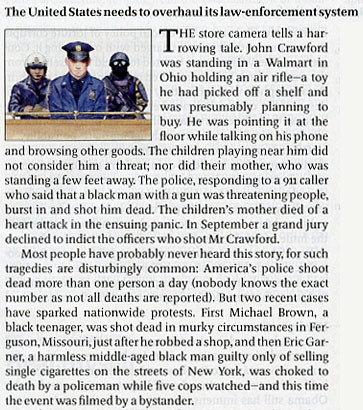 "America was never innocent. We popped our cherry on the boat over and looked back with no regrtets. You can't ascribe our fall from grace to any single event or set circumstance. You can't lose what you lacked at conception". "Jack talked a slick line and wore a world-class haircut. He got whacked at the optimum moment to assure his sainthood. It is time to dislodge his urn and cast light on a few man who attended his ascent and facilitated his fall". Sinterklaas arrived in the Netherlands ('Nederland') yesterday, alas under much controversy (even, or perhaps caused by, international criticism). Sinterklaas is a traditional figure based on Saint Nicholas. Other names for this iconic figure include De Sint ('The Saint'), De Goedheiligman ('The Good Holy Man'), and De Goede Sint ('The Good Saint') in Dutch as well as Saint-Nicolas in French; Sinteklaas in Frisian; and Kleeschen and Zinniklos in Luxembourgish. Sinterklaas (Sint Nicolaas) is celebrated annually with the giving of gifts on the night before Saint Nicholas Day (5 December) in the Netherlands and on the morning of Dec. 6th, Saint Nicholas Day itself, in Belgium, Luxembourg, and Northern France (French Flanders, Lorraine and Artois). He is also well known in territories of the former Dutch Empire, including Aruba, Bonaire, Curaçao. 'Sint Nicolaas' is one of the sources of the popular (American) Christmas icon of Santa Claus. Other holiday figures based on Saint Nicholas are celebrated in some parts of Germany and Austria (Sankt Nikolaus); Switzerland (Samichlaus); Italy (San Nicola in Bari, South Tyrol, Alpine municipalities, and many others); parts of Bosnia and Herzegovina, Croatia and Serbia (Sveti Nikola); Slovenia (Sveti Nikolaj or Sveti Miklavž); and Greece (Agios Nikolaos), among others. In the 4th century Saint Nicholas (in Dutch floklore 'Sinterklaas', in German 'Sankt Nikolaus'), the bishop of Myra lived in a small village in what is now Turkey. According to legend he saved his village from starvation. According to the same legend he managed to raise three children from the death and gave these poor girls gifts and dowries. Some sources claim he passed away on 06Dec343. In 1087 his remains were transported to Bari, Italy. Why in this old Dutch tradition Sinterklaas resides in Spain is not clear. Perhaps because he was the patron of sailors in the 17th century, with shipping of great importance to the Dutch in those days and with many Spanish contacts. This would also explain why his helpers are coloured, resembling moorish people (the Moors ruled Spain for centuries). So anyway... Sinterklaas is not the subject of the controversy, but his coloured black helpers are. The Dutch had a large stake in transport and trade of slaves and these 'Zwarte Pieten' seem to remind people, both national (influx from overseas) as well as international. I hesitate to decide whether such tradition should remain unchanged or altered, to pacify those who criticise Zwarte Piet and feel offended by his black appearance. Those in passionate defense often speak from memories of themselves, how they enjoyed (and enjoy) this tradition. So much changes around us, it would be nice to hold on to a tradition such as this. Sinterklaas, the old bishop certainly does not treat his helpers bad, he never makes derogatory remarks. Children who now cheer for Zwarte Piet, do not grow up hating black people. It is obvious Sinterklaas could not function without his black helpers. Humor has a lot to do with celebrating this tradition, much more than the American Santa Claus. Presents (among adults) often go with a message, verse on rhyme. The acrobatic and mischievous black helpers are indeed a comic relief here, nothing to link them to the dark days of slavery. People claim that he, she or someone they know have been called a Zwarte Piet and feel offended. As a result this tradition of Zwarte Piet needs to be eradicated. But misplaced forms of humor will remain and calling people with coloured skins names, I am afraid, will never disappear either. 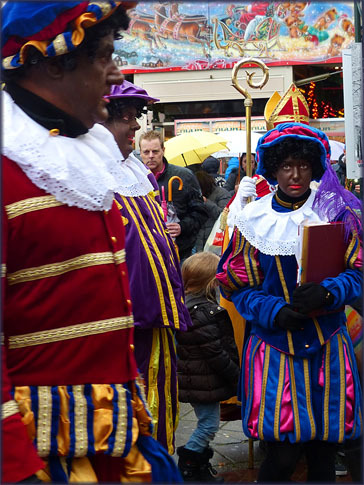 Frankly I cannot see how someone with dark coloured skin identifies themselves with Zwarte Piet: look how they dress? And what would it solve to make Zwarte Piet white: should Caucasian people then be offended? Or are we considered to be less touchy on colour of skin issues? It all seems a matter of how politically correct one wants to be. Obviously so as children so no offense and they cannot be bothered with politics. I think we should be guided by the children's attitude here, and stop being childish. When I arrived in Portland,OR for vacation recently and visited Powell's bookshop ('used & new'), I was more than pleased to find there a new book by Carl Hiaasen. Apparently published in 2013, I had given up looking for his books as I had read them all (from mid-1980s) and there seemed no follow up to 'Star Island' (2010) forthcoming. Glad I was proven wrong, for this is once more a very enjoyable book set in Hiaasen's familiar tone and unique, off the scales humor. Mr Hiaasen is an award winning reporter, since 1976 for the Miami Herald. His stories always take place in Florida and he incorporates acts of govermental incompetence and political dealings bordering on corruption which may have been inspired by actual occurrences; but then he throws it back into fiction by introducing the weirdest characters and situations. No one does this better than Carl Hiaasen. There is more, much more. The funny and weird ingredients are in exact the correct proportion to the crime story and even the romantic side line. 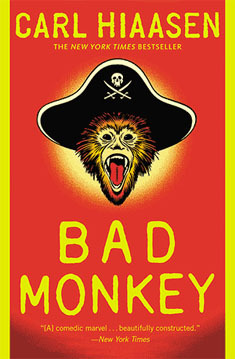 In all respects a very enjoyable books and I for one will yet again keep an eye out for a follow up by Carl Hiaasen!